The Red Centre isn’t just an Australian treasure; it’s a global one. One of nature’s genuine masterworks, it’s our continent’s throbbing heart. Vibrant Indigenous cultures have thrived here for millennia – and remained unknown to outsiders until the 19th century, when white explorers began their fruitless search for a long-gone inland sea. Modern conveniences have made the area more accessible since those times – what would Charles Sturt have made of a GPS? – but the outback retains its eternal wildness and power to stun the senses. So this winter, pack some warm clothes (it’s not always singlet weather out here) and a respect for the landscape and its traditional owners, prep your vehicle (spare tyres, first-aid kit, plenty of water) and discover the Red Centre via the Outback Way. While first-time visitors to the Northern Territory often tick off its sights like they’re working through a meeting agenda (Kakadu – check; Katherine Gorge – check), the Outback Way, which has Alice Springs as its starting point, will steer you towards some of the region’s lesser-known natural marvels – as well as the odd big-ticket star. Storied Alice Springs, roughly halfway between Darwin and Adelaide, is one of the world’s remotest major settlements. Like Broken Hill to the south, the city’s mere existence comes as a shock – ‘How did this all get here?’ – but spend time getting to know it, and you’ll find plenty of interest beyond that. ‘The Alice’ may have a rough-and-tumble rep, but it’s also a fertile cultural hub – while here, as well as enjoying a diverse range of food and drink options, you can educate yourself about the outback before experiencing it first-hand. At the well-curated Aralauen Arts Centre – a part of the impressive Aralauen Cultural Precinct – the importance of visual art to Central Australia’s Indigenous cultures is made dazzlingly clear in the collection of more than 1100 works by (mainly) local artists. At the nearby Museum of Central Australia, you can investigate the region’s pre-history – starring giant crocodiles and other megafauna – and browse a fine collection of local geological and ecological artefacts. For more recent history, inspect original Royal Flying Doctor Service planes and other aviation curios at the Central Australian Aviation Museum. 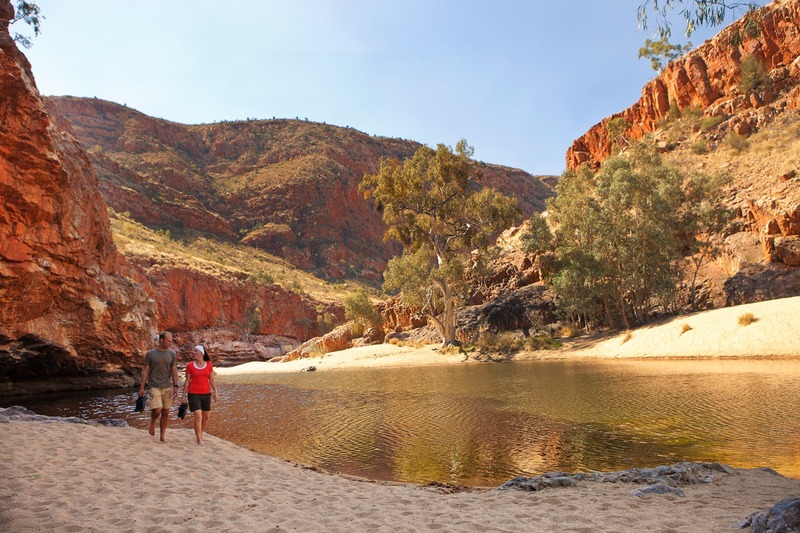 The Outback Way’s first planned stop is Ellery Big Hole in the West MacDonnell Ranges, where, a mere 80 kilometres west of Alice Springs, nature has carved out a perfect swimming spot for humans (one that was traditionally an important meeting ground for the Aranda people). A picnic ground and caravan-friendly camping make this a great base from which to explore the gorgeous landscape via a number of walking tracks where you can take in the area’s geological formations, the legacy of countless ancient floods.